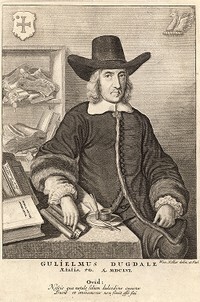 ollar's association with the antiquary Sir William Dugdale began on Hollar's return to London in 1652 at the end of the English Civil War, and the two men appear to have had a close and cordial relationship. Dugdale was devoted to recording for posterity the remnants of British medieval culture and institutions. Hollar's first Dugdale commission was for the Monasticon Anglicanum, a monumental work on monastic history, the first volume of which came out in 1655, with a title page and ten full-page etchings by Hollar. His next work for Dugdale was much more substantial, consisting of 183 etchings for the Antiquities of Warwickshire, published in 1656. Hollar must have immediately started work on Dugdale's next project - his History of St. Paul's Cathedral, which was issued with 45 plates by Hollar, all full page size or larger. The volume, even apart from Hollar's contribution, remains of the utmost significance as it is the only accurate record of the interior of old St. Paul's before the Great Fire of 1666 entirely destroyed the building. Dugdale's intention was to make a permanent illustrated record of the cathedral, which had been the centre and symbol of London for centuries, but had fallen into a serious state of disrepair. In 1551 the spire had been destroyed by lightning and not rebuilt, and the fabric of the building was corroded by city smoke and grime. In 1633 Inigo Jones was commissioned to restore the building, but the work was interrrupted by the Civil War. St. Paul's was further desecrated by the Parliamentarian army who used part of it to stable their horses. Hollar produced etchings of all sides of the exterior of the church, of the nave, choir, and crypt, and of its tombs, monuments, and stained glass. The St. Paul's volume is considered to contain some of Hollar's best work, including the long vista of the nave of the cathedral (P1025). The fire that destroyed the cathedral in 1666 also destroyed 300 copies of the first edition of 1658, as well as five of the original etched plates which could not be salvaged in time. Most of the remaining plates had to be re-worked for Edward Maynard's second edition of 1716.